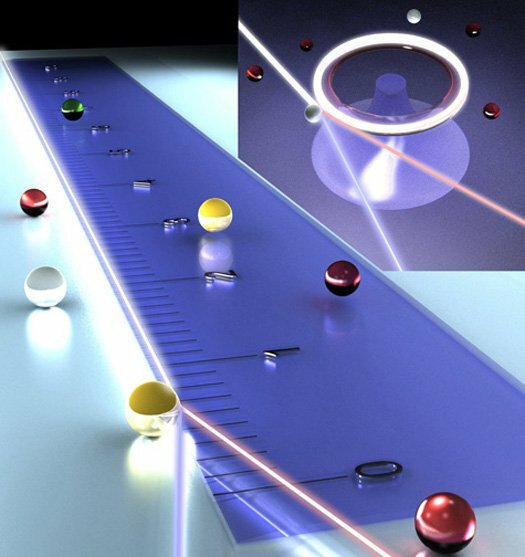 A new type of high-resolution nanoparticles detector called the “Whispering Gallery Resonator” has been developed by professors at the Washington University in St. Louis. The device mainly consists of a very small laser in the micro-size range along with a sensor that is used to detect the presence of individual viruses and particles in the nano scale and also count and measure them with single particle resolution. As its name implies, the properties of the device makes it more reliable to be used in huge cathedrals and galleries. As the inside of these buildings have acoustic spaces, a whisper from one side of the room is also heard at the other side of the room. This property is available only because of the shape of the acoustic space. Spaces other than the ones that are acoustic (which are usually in round, domed spaces), are known to have audible sweet spots. Similarly, the new sensor has sweet spots in the optical range. The basic working of the device has a lot of applications of optical science. In short, a a laser beam in the micro-size range, that is not larger than a slight puncture made by a pin, is created inside a small ring. There occurs a change in frequency as soon as the particle touches the micro-sized laser. This frequency change is denoted and measured to calculate and identify the total number of particles. Many experiments have been carried out with this device, and is said to be accurate even underwater and in blood. The maximum number of nanoparticles counted with this device is 800. When tried to count more, the device showed inaccuracy due to the noise generated. Since the device has been proved to be capable of sensing very small magnitudes than its predecessors, these nanoscale laser sensors can be used as environmental sensors. Thus, they can calculate the chemical changes in water and air and thus prevent hazardous conditions. The researchers are also trying to push the technology further so that it can be used to find the presence of DNA and size each one individually. Amazing research.Thanks for your articular.